Last week we discussed the false denominational notion that people somehow make Jesus Lord or crown Jesus King. As we saw, people obey him because he is already Lord and King ― not to make him Lord and King. There is a great deal of misunderstanding about the reign of Christ, and much of it comes from misunderstandings about the book of Revelation. It is held that the Old Testament prophets predicted the re-establishment of David’s kingdom and that Christ himself intended to bring this about. It is alleged however, that because the Jews refused his person and work he postponed the establishment of his kingdom until the time of his return. Meanwhile, it is argued, the Lord gathered together ‘the church’ as a kind of interim mea­sure. How anyone could read the Bible and believe that Jesus failed in anything he intended to do is inconceivable! How anyone can read the Bible and conclude that the church is a mistake or an afterthought or “a kind of interim measure” is likewise inconceivable! Premillennialism is not simply a matter of opinion on which we can agree to disagree. Rather, it is a false doctrine that runs counter to the gospel of Jesus Christ, belittles the work of Christ, and belittles the church of Christ. We discussed these issues in our introductory classes, and we will have more to say about this dangerous heresy when we get to Chapter 20. Chapter 18 is a form of prophetic literature called a “doom song” that is common in the Old Testament. Isaiah 13:19-22 is a doom song for Babylon. Isaiah 34:11-15 is a doom song for Edom. Zephaniah 2:13-15 is a doom song for Nineveh. In each case, the ruin of a great city is described in vivid, poetic language interspersed with apocalyptic speech. Here — just as a careful student of the Old Testament should have expected — we have a doom song for Rome. 1 After this I saw another angel coming down from heaven, having great authority; and the earth was made bright with his splendor. Behold, I will stir up the Medes against them ... And Babylon ... shall be as when God overthrew Sodom and Gomorrah. It shall never be inhabited, neither shall it be dwelt in from generation to generation: neither shall the Arabian pitch tent there; neither shall the shepherds make their fold there. But wild beasts of the desert shall lie there; and their houses shall be full of doleful creatures; and owls shall dwell there, and satyrs shall dance there. And the wild beasts of the islands shall cry in their desolate houses, and dragons in their pleasant palaces: and her time is near to come, and her days shall not be prolonged. Surely the most dramatic part of the picture is the demons haunting the ruins. The pagan gods banished from their reign haunt the ruins of the temples where once their power had been supreme. The language denotes utter devastation and utter desolation. That is what it meant in Isaiah 13 about Babylon, and that is what it means here about Rome. Rome was a great military and commercial power, and Rome enticed other nations to follow her wicked example. Rome was powerful and arrogant and openly boasted of her abominations. By the strength of my hand I have done it, and by my wisdom, for I have understanding; I have removed the boundaries of peoples, and have plundered their treasures; like a bull I have brought down those who sat on thrones. My hand has found like a nest the wealth of peoples; and as men gather eggs that have been forsaken so I have gathered all the earth; and there was none that moved a wing, or opened the mouth, or chirped. Rome had the same attitude as that Assyrian king and ultimately suffered the same fate. 4 Then I heard another voice from heaven saying, “Come out of her, my people, lest you take part in her sins, lest you share in her plagues; 5 for her sins are heaped high as heaven, and God has remembered her iniquities. • Isaiah 48:20 Go forth from Babylon! Flee from the Chal­deans! • Jeremiah 50:8 Move from the midst of Babylon, Go out of the land of the Chaldeans; And be like the rams before the flocks. • Jeremiah 51:6 Flee from the midst of Babylon, And every one save his life! Do not be cut off in her iniquity, For this is the time of the LORD’S vengeance; He shall recompense her. • Jeremiah 51:45 My people, go out of the midst of her! And let everyone deliver himself from the fierce anger of the LORD. Although the Jewish exiles in Babylon did eventually return to their homeland, they did not flee there. Instead, they returned in three groups. First, some of the exiles returned in 539 BC when Cyrus gave a decree that the Jews should return to Jerusalem and rebuild the temple. (That decree can be found in Ezra 1:2–4 and 2 Chronicles 36:23.) Second, others returned in 458 BC when Ezra led 1500 men with their families to Jerusalem. And third, yet others returned in 445 BC when Nehemiah, a cup bearer in the court of Artaxerxes, asked the king to rebuild the walls of Jerusalem. And these returns happened after the judgment of Babylon by the Persians that Jeremiah wrote about in Jeremiah 50-51. [T]his cry and challenge [to come out] do not involve a coming out at a definite moment. They imply a certain “aloofness of spirit maintained in the very heart of the world’s traffic.” They describe the essential apartness of the Christian from the world.... The Christian is not conformed to the world but transformed from the world (Romans 12:2). It is not a question of retiring from the world; it is a question of living differently within the world. Wherever the Christian finds himself, and whatever his calling in life, his life must stand as a radical protest against the world and its standards. Hope means a continual looking forward to the eternal world. It does not mean that we are to leave the present world as it is. If you read history you will find that the Christians who did most for the present world were just those who thought most of the next. It is since Christians have largely ceased to think of the other world that they have become so ineffective in this. The church has a lot of problems today. Why? Heresy is inevitable when men become more interested in pleasing themselves and in pleasing the world than in pleasing God. Why are some today advocating leadership roles in the church for women? Because they think it pleases God, or because they want to please the world? Why are they bringing instruments into the worship? Because they think it pleases God, or because they want to please the world? Why are they watering down baptism? God commands that Rome be punished and that vengeance be exacted. To whom is this command directed? We know it is not directed to the church because the church is commanded in Romans 12:19 not to seek vengeance. 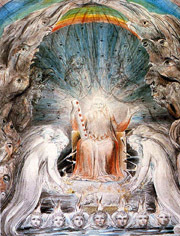 Some argue the command is directed to the 10 horns in 17:16 who would “hate the whore, and shall make her desolate and naked, and shall eat her flesh, and burn her with fire.” Others argue the command is directed toward the angel who is acting on God’s behalf as his instrument of justice. • Psalm 137:8 O daughter of Babylon, who art to be destroyed; happy shall he be, that rewardeth thee as thou hast served us. • Jeremiah 50:29 Repay her according to her work; According to all she has done, do to her; For she has been proud against the LORD, Against the Holy One of Israel. Son of man, say unto the prince of Tyrus, Thus saith the Lord GOD; Because thine heart is lifted up, and thou hast said, I am a God, I sit in the seat of God, in the midst of the seas; yet thou art a man, and not God, though thou set thine heart as the heart of God: 3 Behold, thou art wiser than Daniel; there is no secret that they can hide from thee: 4 With thy wisdom and with thine understanding thou hast gotten thee riches, and hast gotten gold and silver into thy treasures: 5 By thy great wisdom and by thy traffick hast thou increased thy riches, and thine heart is lifted up because of thy riches: 6 Therefore thus saith the Lord GOD; Because thou hast set thine heart as the heart of God; 7 Behold, therefore I will bring strangers upon thee, the terrible of the nations: and they shall draw their swords against the beauty of thy wisdom, and they shall defile thy brightness. In verse 7 Rome boasts that she will never see the very thing that God said she would see ― “A queen I sit, I am no widow, mourning I shall never see.” Rome’s pride (like all pride) caused Rome to feel that it had no need for God. Rome was all that Rome needed! Rome was full of pride and thought it would never and could never fall, and Rome was not the last nation to feel that way. Pride is one of seven things that God hates in Proverbs 6:16-19, and the pride that God hates is the arrogance of those who feel they have no need of God. God’s punishment for pride in the Old Testament was to inflict extreme humiliation, and that is what God promises Rome. “When pride comes, then comes shame.” (Proverbs 11:2) Rome would plummet from her glory to her destruction quickly and her destruction would be total and complete. Rome’s affluence, pride, and gaiety would be replaced by death, mourning, and famine. You said, “I shall be mistress for ever,” so that you did not lay these things to heart or remember their end. 8 Now therefore hear this, you lover of pleasures, who sit securely, who say in your heart, “I am, and there is no one besides me; I shall not sit as a widow or know the loss of children”: 9 These two things shall come to you in a moment, in one day; the loss of children and widowhood shall come upon you in full measure, in spite of your many sorceries and the great power of your enchantments. 10 You felt secure in your wickedness, you said, “No one sees me”; your wisdom and your knowledge led you astray, and you said in your heart, “I am, and there is no one besides me.” 11 But evil shall come upon you, for which you cannot atone; disaster shall fall upon you, which you will not be able to expiate; and ruin shall come on you suddenly, of which you know nothing. Both Babylon and Rome were filled with pride, and both later had to eat their boastful words. Isaiah 14 presents a vivid picture of the Babylonian king going into the underworld after his destruction to be greeted by other fallen nations. Rome and its godless emperors would one day make a similar trip and receive a similar greeting. Is Revelation relevant today? Yes, very much so. One way in which it is particularly relevant is that it reminds us that history repeats itself. Egypt, Babylon, and Rome — all great enemies of God and God’s people, and all judged by God. What other cities have taken or will take their place on that list? 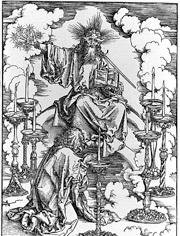 Verses 9-19 contain three dirges for Rome: The first in verses 9-10 is a dirge sung by kings. The second in verses 11-16 is a dirge sung by merchants, and the third in verses 17-19 is a dirge sung by shipmasters and sailors. Each of these dirges speaks of the greatness, the wealth, and the luxury of Rome. He never wore the same garment twice.... He fished with a golden net drawn by cords woven of purple and scarlet threads. It is said he never made a journey with less than a thousand carriages, with his mules shod with silver. From an earthly vantage point it seemed that Rome had everything and the church had nothing, but the exact opposite was true! The kings in these verses placed great faith in the military might and power of Rome. How could they possibly lose while betting on Rome? But what they did not know until it was too late was that Rome is fallen! This lament by the merchants is very similar to and likely modeled after the lament over the city of Tyre found in Ezekiel 26:1 — 28:19. The phrase “slaves, that is, human souls” in verse 13 is interesting. A better translation might be “slaves, even the lives of men.” There were some 60 million slaves in the Roman empire. It was not unusual for a man to own 400 slaves, and those slaves were used for many different purposes. Some masters had slaves walk in front of them so they could return the greetings of friends when the master was to tired or disdainful to do so. Another had an educated slave stand behind him at dinners to supply him with witty quotations. Others used slaves to remind them when to eat and when to sleep. As Barclay reminds us, “a society built on luxury, on wantonness, on pride, on callousness to human life and personality is necessarily doomed.” That was true then, and it is true today. Why do the merchants weep? They weep because of their loss of business. Their lament is not for Rome but for their own lost profit. They have merchandise with no one to sell it to. Their concern for Rome is much like China’s concern today for the U.S. — a concern totally motivated by self interest. The merchants, like the kings, stand far off and watch the destruction. They do not attempt to help the great city. The kings believed that Rome was a stronghold destined to endure forever. The merchants believed that Rome was a market destined to endure forever. If there is one message in Revelation it is this: There is but one eternal kingdom! The church of Christ is the only eternal kingdom. No kingdom of man will endure. Many commentators discuss at length the various items listed in verses 12-13, but we will not. In short, these are all items that could be found in Rome and that arrived there from all over the world. The cinnamon and the silk likely came from China, and the spices likely came from India. 17b And all shipmasters and seafaring men, sailors and all whose trade is on the sea, stood far off 18 and cried out as they saw the smoke of her burning, “What city was like the great city?” 19 And they threw dust on their heads, as they wept and mourned, crying out, “Alas, alas, for the great city where all who had ships at sea grew rich by her wealth! In one hour she has been laid waste. Nero’s fire raged a week and failed to destroy the entire city yet the fire that God sends destroys the city in one hour! Rome’s fall is total and complete and worse than anything Rome could imagine. At the sound of the cry of your pilots the countryside shakes, and down from their ships come all that handle the oar. The mariners and all the pilots of the sea stand on the shore and wail aloud over you, and cry bitterly. They cast dust on their heads and wallow in ashes. Although Rome was not on the coast, the merchandise of the world entered at its port in Ostia. And again, the shipmasters weep over their loss of trade. Their concern is for themselves, not for Rome. We see in these verses the incredible materialism of Rome, and if we are looking for modern day parallels, that one is impossible to miss. We may still print “In God We Trust” on our money, but our actions speak much more loudly than those words. My own feeling in the matter is due to my very firm conviction that to put such a motto [In God We Trust] on coins, or to use it in any kindred manner, not only does no good but does positive harm, and is in effect irreverence which comes dangerously close to sacrilege. A beautiful and solemn sentence such as the one in question should be treated and uttered only with that fine reverence which necessarily implies a certain exaltation of spirit. Any use which tends to cheapen it, and above all, any use which tends to secure it being treated in a spirit of levity, is from every standpoint profoundly to be regretted. The saints, the apostles, and the prophets are shown here in contrast to the kings, the merchants, and the sailors. Then the heaven and the earth, and all that is in them, shall sing for joy over Babylon; for the destroyers shall come against them out of the north, says the Lord. But I thought we were supposed to weep with those who weep. Aren’t the Christians in verse 20 rejoicing with those who weep? Absolutely! But they are not doing so out of personal bitterness. Their concern, like that of the four living creatures, is for the holiness and reputation of God. They rejoice at the vindication of God and at the defeat of this great enemy of God. These events are an answer to their prayers! How could they not rejoice? God had imposed on Rome the sentence that Rome passed on the church. Rome, like Babylon, would fall never to rise again. There would be no revived Roman empire. It is interesting (but not surprising) that premillennialists teach just the opposite! They say that the so-called antichrist will rule from a revived Roman empire. Verses 22-23 show us five aspects of normal Roman life that would vanish. The sound of musical instruments and rejoicing would go away. The sound of craftsmen plying their trade would never be heard again. The sound of the mill would disappear. No lights in the houses or in the streets would be seen again. The sounds of weddings would no longer be heard. Rome is to become a terrible silent and dark desolation. Rome, which had once set Christians aflame to provide light for Nero’s drunken orgies, would be plunged into darkness and silence. Why did this happen? Verses 23-24 give us three reasons: (1) Thy merchants were the great men of the earth, (2) all nations were deceived by thy sorcery, and (3) in her was found the blood of prophets and of saints, and of all who have been slain on earth. Was Rome a great nation? Yes, it was the greatest the world had ever seen from an earthly perspective. But Rome had not used that greatness for a good purpose. Instead, Rome had used its greatness to deceive and mislead the world. Rome had made its material greatness the goal of its existence. Rome had used its great power to persecute and murder the people of God. Rome had caused all nations to adopt her false standards and her false worship. Rome fell because Rome was covered with the blood of God’s people, and, like Tyre in Ezekiel 24:6, was truly a “bloody city.” Rome fell because Rome worshipped wealth and luxury. Rome fell because Rome lived a prodigal and wanton life. Rome fell because Rome found no pleasure except in materialism and perversity. Rome fell because Rome was lifted up with pride and felt it had no need for God. Waste? Materialism? Wantonness? Perversity? Pride? The shedding of innocent blood? Do we see any modern day parallels in that list? God’s people were told to rejoice in Chapter 18, and that is what we see them doing in Chapter 19. They rejoice over the fall of the great city and the victory of the church. The great joy of those who overcame and conquered is compared here to the joy that accompanies a great wedding feast. The picture is one of victory and unrestrained joy. The battle at Armageddon (that was first portrayed in Chapter 16) is considered again in this chapter. The two beasts are defeated and cast into a lake of fire. This chapter provides some of the details that were omitted when the battle was first described. A great multitude in heaven rejoices over the judgment of the harlot. This great multitude (which we first saw in 7:9) represents all of God’s people both living and dead. Although they are pictured in heaven, this book has consistently divided the godly from the ungodly by describing the former as being in heaven while describing the latter as those that dwell on the earth. Verse 2 reminds us that God’s judgments are true and just. God’s greatness rests not just on his power but on his character. His judgments are always true and just, and this judgment of Rome is no exception. In judging Rome, God avenged the blood of his martyrs as they had requested him to do in 6:10 where they cried with a loud voice, “O Sovereign Lord, holy and true, how long before thou wilt judge and avenge our blood on those who dwell upon the earth.” That prayer set events into motion, and verse 2 tells us that prayer has been answered. Verse 2 also provides an important focus for what is about to be described. Verse 2 tells us that the focus of this joy and the focus of the judgment is the great harlot — and that great harlot is Rome. We should keep that context in mind if we are tempted at times to leap ahead 1000’s of years (and possibly many more) to the final judgment at the end of time. This vision is still focused on Rome! Rome is depicted in verse 3 as a city set on fire by God that burns forever. In 18:9-10 the kings of the earth stood far off and watched the city burn. The shipmasters in 18:18 also watched the great city burn. Fire is a common symbol for the judgment of God. Sodom and Gomorrah were literally destroyed by fire, yet eventually the fire went out. Nevertheless, Jude 7 says that Sodom and Gomorrah are presently undergoing a punishment of eternal fire. Just as Sodom and Gomorrah and the surrounding cities, which likewise acted immorally and indulged in unnatural lust, serve as an example by undergoing a punishment of eternal fire. Those two cities fell never to rise again, and their fall serves as an eternal example. Edom is likewise described in Isaiah 34 as burning forever. That they burn forever simply means that they serve as an example forever. We are seeing the smoke from those cities as we study about their judgment and heed their example. Rome provides an eternal illustration of the power of God and of his ability to deal with anyone or anything that opposes his will and harms his people. In that sense, Rome burns forever and the smoke that rises from it is always visible.